To celebrate Christmas in style, SOS staff were invited to Hoar Cross Hall on Saturday 19th December for our annual Christmas party. During the evening, a raffle was held to raise money for local charities and awards were given out recognising staff achievements throughout the year. Guests were invited to buy raffle tickets for prizes given out on the evening. Photos were taken throughout the evening and are available for a small charity donation. All of the proceeds from evening are being donated to local charities. 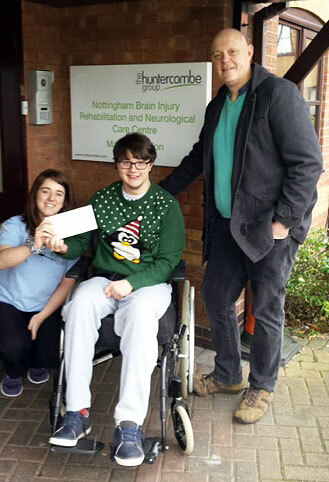 We donated £150 to the Nottingham Brain Injury Rehabilitation and Neurological Care Centre. The centre has provided support and services to SOS employee Keith Endacott-Jone’s son, Elliot who was injured in a car accident a few years ago. The money will go towards helping others who have been through similar life changing incidence. The rest of the money was donated to the Burton Upon Trent District YMCA who provide support and accommodation to the homeless.